You want a lightweight stroller, but it has limited space in the basket. You hang bag hooks all over to hang a diaper bag, grocery bag, shopping bags. Or you do have the basket space, but you end up rummaging everything in the basket. You want extra space. How to go find that extra space?? Short of dumping it on the passenger’s lap. Haha. Tried that and QT definitely wasn’t cool about it. Neither was Ollie happy to carry ANY of the groceries. Pfffpt. Kids. Looks pretty innocent eh? I wasn’t sure how spacious it would be, but hey, it would seem to solve some of my stroller storage issues, so I gave it a shot and bought one off Amazon. Ho-mah-gawwwwd. It is officially one of my to-go bags when I am taking the kids out for a long period of time. 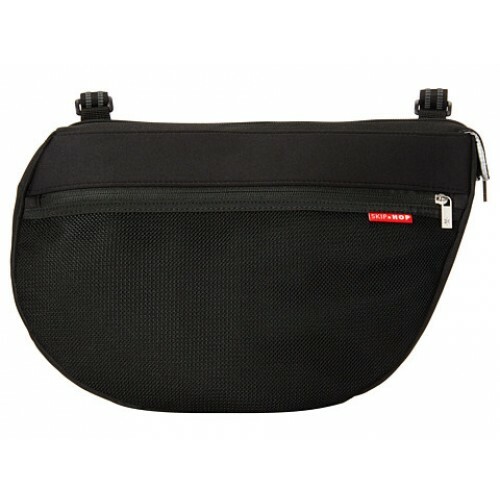 It is even my cycling saddle bag! It has a really really wide base. 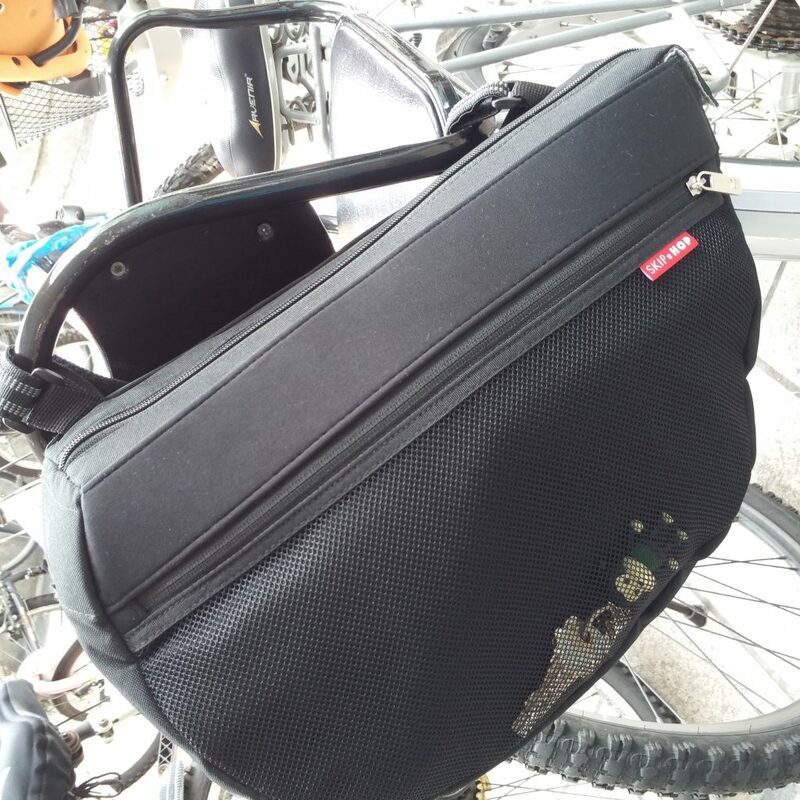 I stuffed a rolled up Manduca SSC inside it for a cycling trip, together with water bottles, snacks, diapers, wipes and wallet. Some stuff that I wanted to be able to reach for easily instead of having to dig into my diaper bag. It would be stuff like snacks, activity books, iPad, small pack of wipes. The zip pulls upwards, so it was really easy to close the saddle bag up. 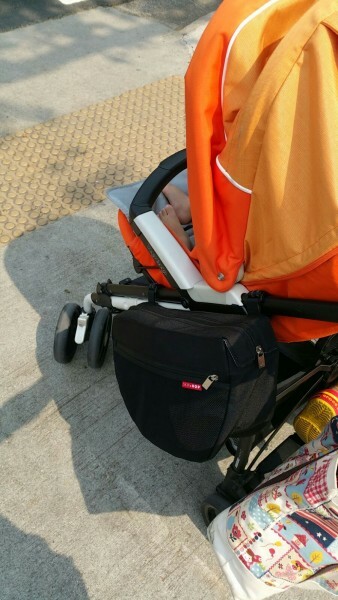 The saddle bag comes with 3 velcro straps making it easy for parents to secure it to the stroller, and it is adjustable to the thickness of the stroller frame too (to a certain extent). 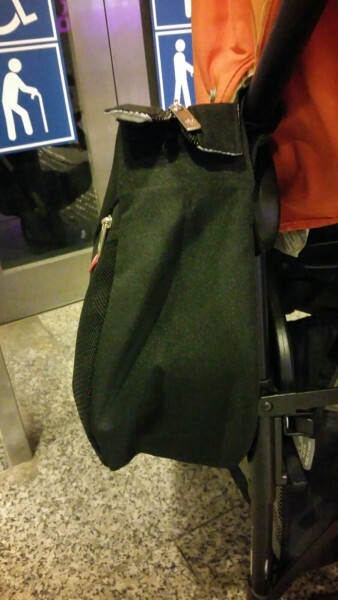 It did take me a while to figure out where the best spot was to attach the bag, and to be able to fold the stroller with the bag still attached to it. But when it was all figured out, it was all good! Hellooooo extra storage. Come to mama! If I didn’t strap the boys in the stroller, they could also easily access the saddle bag, which meant I didn’t have to consistently answer to ‘mummy, I want a cracker. I want a snack, I want some water..’ Phew. And then…I discovered another use for it. With one kid in front, and another behind, I definitely cannot use a backpack, and the basket is too small (already holding stiff bicycle chain and water bottles). This was a total godsend cos I could just strap it to the back of the bike seat behind! 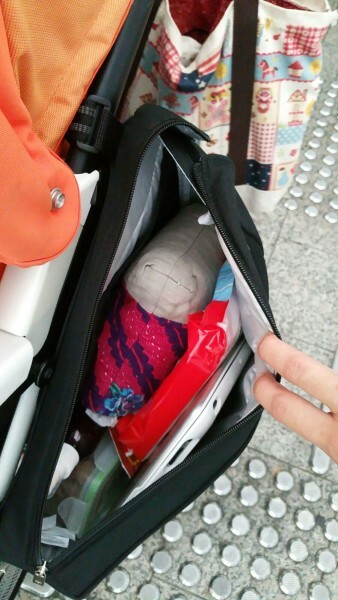 I’ve squished in waterpark gear (2 x swimming attire, towel, snacks, wallet, diapers, wipes, change of clothes). It is hubby approved too! haha He has also used it for some bike rides where he squished in a lunchbox of fruits & snacks, water bottles, diapers, wipes. Definitely our to-go bag for bike rides. this is the bag for you. Get it!